Kettle Kups has added French Onion Soup to its line of Keurig K-Cup soup offerings. The soup is Keurig 2.0 compatible. The latest soup increases Kettle Kups' soups to four. The other flavors are Homestyle Beef Soup, Homestyle Chicken Soup and Garden Vegetable Soup. Kettle Kups says in a release that it doesn't "force a packet of dried noodles upon the consumer." It says it provides a "clean, healthy broth in which vegetables and pasta of one's choosing can be added, stirred, and ready in minutes." 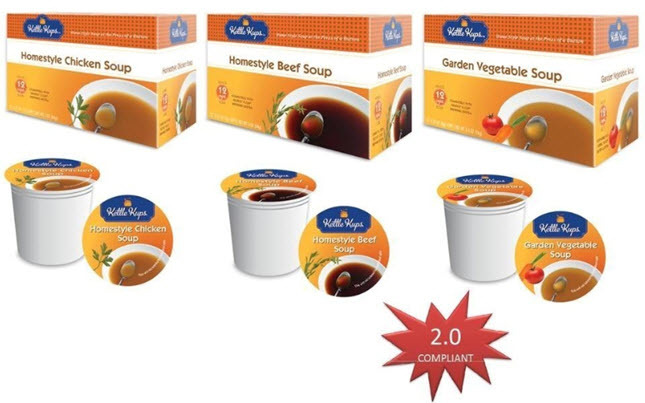 Kettle Kups hasn't yet listed the nutritional information for the French Onion Soup but the other soups have about 19 to 22 calories per 7 gram serving (1 K-Cup) and 3 to 4 grams of carbohydrates. The soups have have no MSG and are gluten-free. The soups retail for $12 a box (12 servings) on the Kettle Kups site. They can also be found at Safeway/Albertsons stores in the Southwest, Rocky Mountain states, mid-Atlantic and New England. The soups can also be found on Amazon.com.